Per popular request, I’ll start throwing out, so to speak, some stories from my Air Force flying days. We go fairly far back for this one, pilot training, 1977. In the Air Force, at least in my day, the first flying lessons in jet aircraft occurred right after graduation from college. The course was called “undergraduate pilot training” or (the military loves acronyms) UPT. My tour of UPT occurred at Columbus Air Force Base in Mississippi. In an earlier blog (here), I mentioned some surgery I had in high school. It was major surgery to remove a tumor from inside and outside of my sinuses, just below the brain. It went so well, the Air Force considered me medically OK to be a “rated officer”, a pilot. But perhaps they shouldn’t have. 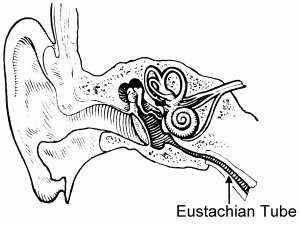 Truth was, one of the surgeries apparently “stretched my left Eustachian tube” per one of the doctors. See illustration below. It was not enough to affect my normal life, but I was a little slower to equalize the pressure in my ears with this stretched, and apparently thinner, tube. Under regular circumstances, I could, and still can, equalize the pressure in my head at will. I don’t need tricks like swallowing or yawning. I can simply flex those muscles directly, just like I can wiggle my ears at will. (More on all my superpowers in a later blog.) But apparently the demands of flight (and later I learned, scuba diving) are a bit more of a challenge for me. In the first half of UPT, every student learns to fly the T-37 Screaming Mimi. This jet does not go supersonic. That’s the T-38 Talon which the student flies in the second half of UPT. But what the Screaming Mimi can do, besides emit the loudest, high pitched squeal of any aircraft, it can drop like a rock. It can go into a “flat” spin and stay in the spin until forced out by the student. Spinning is not flying. It is dropping. The T-37 can do this at the rate of about 10,000 feet per minute or over 160 feet per second. To overstate the obvious, recovery from a spin is an important skill for a pilot to learn. Thus, the T-37 was designed to help teach this skill. “Flat” is a little misleading, the aircraft has the nose pointing down a bit as it spins in the horizontal plane rapidly around its center. Since the wings cannot provide lift, it drops. Even the most avid roller coaster riders may find this to be too much. (For a dissenting opinion from an old Tweet Pilot, see http://waltshiel.com/2012/11/spinning-the-tweet/) The recovery from the spin has to be equally abrupt and violent in order to jerk the aircraft into a high-speed dive. The high speed dive recovery is a bit less violent and involves increased g-forces that helped to keep my lunch down. (See description below at the end of this blog.) But wait, there’s more. The cockpit is unpressurized. The pilot must wear an oxygen mask and must be able to equalize pressure in their ears often as the aircraft ascends and very, very quickly as it drops. After all this set up, I must now reveal that my left ear and the air pressure really was perhaps not that big of a factor for me in the T-37. I seemed to have had a lot more trouble with that in the T-38. But perhaps I was really too busy during T-37 spin rides feeling terrified and wretched and forcing myself not to vomit to even remember if my ears were clearing. I never had the scientific detachment to determine if my left ear was a factor in my dizziness and nausea. I suspect not, since so many others had the same adverse reactions. As an aside, astronaut Mike Collins, in his autobiography, Carrying the Fire (read it! ), discussed his concerns that, as an astronaut, he might get space sick. He took his T-38 up one day to determine if the most iron-gut, non-airsick “right stuff” person like him, could get air sick. His findings: Yes. Now that is scientific detachment. It also makes me feel a little better than I am simply on a scale with Mike Collins. He’s way over there and I am here, but we are at least on the same airsickness scale. On a typical T-37 spin ride, the instructor pilot and I would perform spin after spin after spin until the fuel level would dictate a return to base. With my head still spinning, we would bounce along through the unsettled air typical of the South and then, once back at the airfield, since a little fuel would always remain, practice bouncing around in the flight pattern for touch and go landings until we had to land based on fuel remaining. Throughout the entire flight, I would be constantly assessing the amount of air time left (fuel remaining) against my ability to keep my gut in check. Hope springs eternal. At the beginning of the flight, I would be beaming with confidence that I had somehow acquired an iron stomach since last time. And always my hopes would be dashed with the first spin and increasing waves of nausea. As the flight progressed, my prayers would become more fervent to not embarrass myself by having to pop off my oxygen mask quickly, vomit in a plastic sack, and re-attach the mask to breath. My focus became, first, get past one spin and recovery. Then get past the next spin. Then, etc. In between each spin would be a brief respite as we would climb back up to altitude (not too bad, but not long enough to completely recover from the nausea). Then, after all the spins & recoveries, the bouncy ride back (again, not too bad but not enough to recover). Then how many times will we circle the field practicing landings? Ugh! However, once on the ground, the motion sickness would almost completely vanish. So I rarely had to carry my lunch in a bag more than once in one day. There was also the psychological factor: I was concerned that if I did vomit too much, I might be invited to leave pilot training. A good pilot must mult-task many things all at once: fly the aircraft, talk on the radio, keep awareness of everything around him, keep an eye on fuel and time, scan the outside sky and scan the multitude of cockpit instrument and so on. I was quite good. I was able to squeeze in fervent prayer into the mix. Well, I had intended to have this little story lead into my T-38 solo flight where I wound up hurling head long at 300 nautical miles per hour at a fellow solo student coming straight at me at 300 nautical miles per hour just 1500 feet off the ground. I guess we’ll hit that story next week. *It was a very good skill to learn, that is, how to perform the following somewhat complex maneuver while feeling awful and wanting to panic. Feelings and physical illness are one thing, taking control and doing the right thing no matter what, is quite another. It is one of those things that set you apart. If you haven’t already, you should learn to do it.